Do you long for the little blue FindIt! icon for full-text when using PubMed's mobile site on your iPhone or mobile device? Add our experimental bookmarklet to your device's bookmarks. When you find yourself on a page like http://www.ncbi.nlm.nih.gov/m/pubmed/24862208 just click the bookmarklet to search the PMID with KUMC Libraries' FindIt! Drag it to your desktop browser's bookmarks, too! It works on standard non-mobile PubMed URLs like http://www.ncbi.nlm.nih.gov/pubmed/24862208. In Google Scholar, the "FindIt @KUMC" link is missing. Will it be coming back? Links to KUMC-licensed content should be restored in Google by Tuesday 11/25 or Wednesday 11/26. There was a technical issue between Google and the Library's vendor that provides this data. The vendor has fixed the problem and Google Scholar will update their index as scheduled around that time. If you have not set KUMC Libraries as one of your Google Scholar Library Links, go to Google Scholar > Settings > Library links. 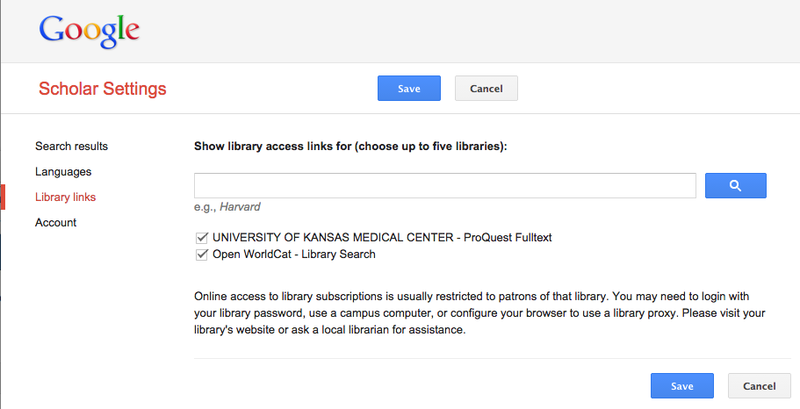 Search for "university of kansas medical center" and any other libraries you have access to. Beginning November 19, the "One University" Open Access Fund is once again made possible by contributions from the offices of KU Provost, KU Vice Chancellor for Research & Graduate Studies, and KUMC Vice Chancellor for Research. Due to the significant number of applicants but limited funds during the two-year pilot of this fund, considerable evaluation of award results and consultation with KU and KUMC faculty and researchers resulted in changes to the application process, criteria, and awarding of funds available for the remaining FY15 and FY16. The awarding will now be a monthly competitive process reviewed within the first 5 business days of each month. Priority will be given to graduate students, early career research staff, pre-tenure faculty, those with little or no research funding to support their open access publishing, and first time OA Fund applicants. You can find full details of the OA Fund here. To request funds, please go here. KU, KU Law, and KUMC libraries administer and assess the program with oversight provided by the KU Provost, KU Vice Chancellor for Research & Graduate Studies, and KUMC Vice Chancellor for Research. After four years, Dykes Library has ended the Meet Our Experts program. Effective November 14, 2014, no new publication data or profiles will be added to Meet Our Experts. However, the site will remain online and accessible until November 2016. The Library Technology team will work with departments and research teams to transport publication data from Meet Our Experts to ORCID Profiles. Continue to link to Meet Our Experts profile pages until November 2016. Replace the Meet Our Experts link with a link to PubMed's list of publications. See an example at Biochemistry faculty pages. Encourage faculty to sign up for an ORCID Profile and link to the ORCID record. See examples here and here. Work with the Library and Web Services to explore other options. Efforts moving forward will focus on identifying better tools and services for the researcher community. The Library remains committed to improving researchers' ability to get correct attribution for their scholarships, highlighting research collaborations, and expanding the visibility of KU Medical Center scholarships. Please contact our Research and Learning team with comments or questions. On September 10, 2014 JAMA published a viewpoint article with advice for authors wishing to publish their review articles in JAMA. Careful scrutiny is needed in systematically conducting the literature review. For this purpose, JAMA recommended collaborating with a medical librarian. Thorough searches are difficult, but a medical librarian can create a customized and systematic roadmap for the process which will reduce bias in the final article. Additionally, librarians’ experience with the databases will make the search process more efficient and effective. This advice translates well to other disciplines and scholarly journals as well. If you are writing and article for JAMA or another scholarly journal, please contact A.R. Dykes Research and Learning Department to set up a research consultation appointment.